This is a super easy recipe to make using boxed brownies or your own easy homemade brownies. First you'll need to mix up your brownies (according to the box directions for 13x9 pan size or according to your homemade recipe). Pour the batter into a prepared dish and set aside. Beat the eggs, sugar and vanilla on high until light and fluffy, about 3-5 minutes. Add pumpkin and oil, beat until combined. Mix spices, flour, baking powder and salt together in separate bowl, then fold into the pumpkin mixture. Once it's combined, spoon large dollops onto the top of the prepared brownie batter. Using a spoon or spatula, carefully swirl the pumpkin into the brownie batter. Do not over swirl, you want it to look pretty when you slice into it. Bake at 350 degrees F for 35-45 minutes until a toothpick inserted comes out clean. This is so good and super easy! They look really pretty when cut and the pumpkin flavor combined with the chocolate is delightful! Can't wait to try the other recipes on my list! What a yummy and fun recipe! Perfect for this time of year!!! This is such a cool idea! They look fantastic, and what a great twist for this time of year. Thanks for sharing the recipe. These look really good! It's a good brownie for autumn! This recipe is unique!!! 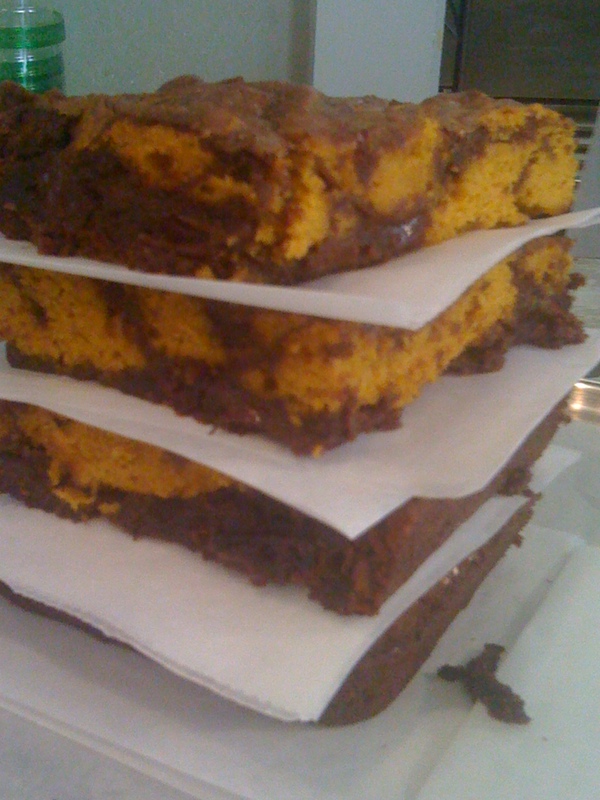 I've never thought about combining pumpkin and brownies. Bravo! You certainly did make an attractive dessert. I like the combo of chocolate and pumpkin. I am taking bets, I make these. I love pumpkin & chocolate together, so these are going to be on my list for a treat to make real soon! I made pumpkin chocolate chip cookies today, but brownies and pumpkin together - heaven!! : ) Thanks for sharing this!! This looks incredible. Pumpkin and chocolate, oh my, a perfect combination in my book. I'm also linked up with Meatless Mondays. Great recipe. These look so delicious! I like the flavor of pumpkin, so am sure it would be great with the chocolate! I just love all the pumpkin recipes I've seen floating around lately. This one is no exception, it looks lovely! I love all these yummy pumpkin recipes! Oh no you didn't!!! These looks so good, was a genius idea!! I am having a pumpkin linky sometime next week so I hope you will link up your awesome pumpkin recipes. Chocolate and pumpkin -a wonderful combination! Yum. I think my kids would love this! Thanks for linking to the hearth and soul hop! I love that there's a good amount of pumpkin in there, looks great. Thanks for sharing at the Hearth and Soul hop. Oh my goodness, what a perfect fall treat! We make homemade brownies about three times a month. They're such an easy, yummy treat. One of my family's favorites. I have six small pie pumpkins from my garden and know exactly what I am going to do with them! Thanks for sharing this. This would be a great post to link to Midnight Maniac Meatless Mondays. Oh, I hadn't thought to do this. Would sweet potato work? I usually use that in place of pumpkin. It probably doesn't have the pumpkin taste though, I could probably add pumpkin pie spice. I'll try it! Looks like a delicious and seasonal way to transform a "boxed" product. Yum!